I hope you all had a fantastic weekend! I was so busy getting things ready for the Friendsgiving brunch I hosted yesterday that I am ready to just relax today. I also splurged at brunch so today I am getting back on track with my clean eating and that includes my fave products from Happy Way! Happy Way is a health food company from Australia specializing in protein powder but they have expanded into powdered greens, fat burners, teas, and more. They make one of my favourite protein powders, Cacao Mint Hemp! It tastes like a legit thin mint and I am obsessed. The Greens powder is a fantastic way to integrate more greens into your diet, I l love their tropical flavour because I can add it to my fruity smoothies perfectly! You can even add it to some coconut water and that is also super delish. I definitely recommend adding it to your routine. The fat burner is basically a pre-workout to help you get energized before a hard workout. The watermelon flavour is 100% my favourite because it tastes like a watermelon Jolly Rancher and I love the burst of energy I get when I take this before I hit the gym. As always if you have any questions feel free to leave them down below or hit me up on any of my socials linked below, I love talking to you guys so don’t be shy! I hope you all have a wonderful Sunday, I am off to watch the Patriots game! I hope you are all having a FAB Monday. I am one of those weirdos who actually loves Mondays because I love starting off a new, fresh week full of opportunities! So today I wanna talk to you all about balls, no not THOSE balls(heads out of the gutter people) Protein Balls, Collagen Balls, Probiotic Balls, and Energy Balls. Health Lab is making the most delicious and healthy wellness balls and I am SO here for it! The company is based in Australia and was created by Jess Thomas who wanted to create a clean, yummy, sweet but healthy treat for women on the go and thats EXACTLY what she did when she founded Health Lab. I love how clean and free of additives/preservatives Health Lab’s products are. That is something I definitely take very seriously and anytime I can find products that take it as serious as I do I love supporting them. All of Health Lab’s products are free of artificial colours, artificial flavours, refined sugars, palm oils, GMOs, preservatives, gluten, and fillers. They are so convenient and perfect for all you busy boss babes. 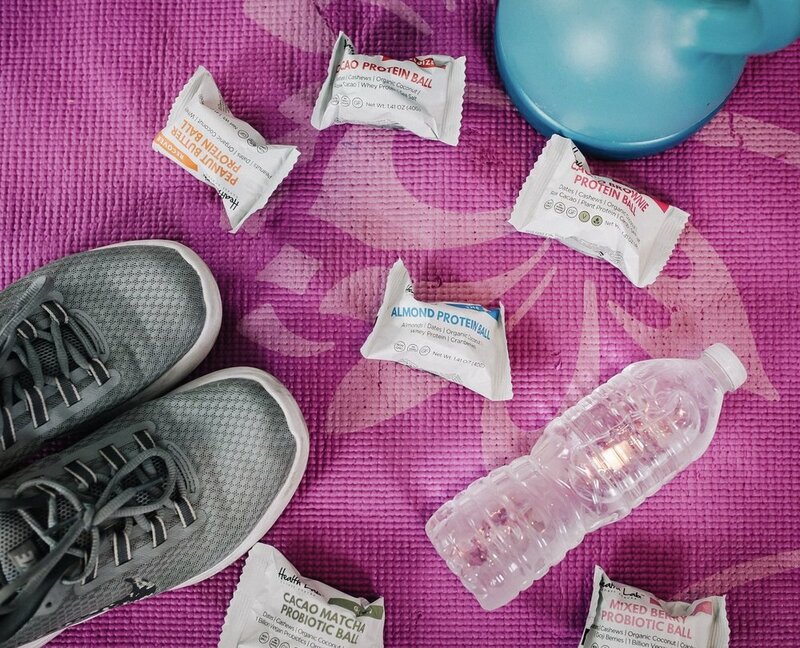 I love throwing them into my purse for a long day of events or meetings and I always keep a few in my gym bag for before or after my workouts. Definitely a great snack when you are on the go or traveling. I am definitely Health Lab’s newest and forever fan. I can’t recommend them enough! You all need to at least try them out because I know once you do you will be HOOKED! For all my Texas babes you can actually buy these at H-E-B so don’t walk, run to your nearest location and pick some up!